This case report describes the successful use of a vascularized cortical autograft from the ipsilateral ulna in limb-sparing surgery for the treatment of distal radial osteosarcoma. 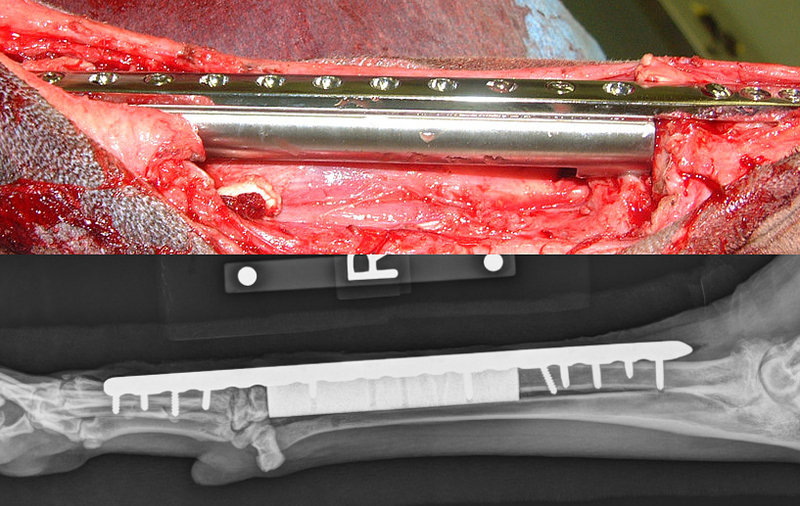 A pancarpal arthrodesis with two orthogonal plates was performed to stabilize the site. No implant failure and local tumor recurrence were observed in the 6 months post operative period. Excellent limb function was achieved within 6 weeks after surgery; no external support (coaptation) were used during the post operative period. Excellent perceived quality recovery, was reported by the dog’s owners, compared to their preliminary outcome expectations. 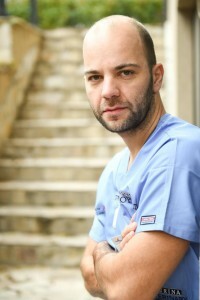 Cementoplasty therapy are rarely applied with limited success 1,2. 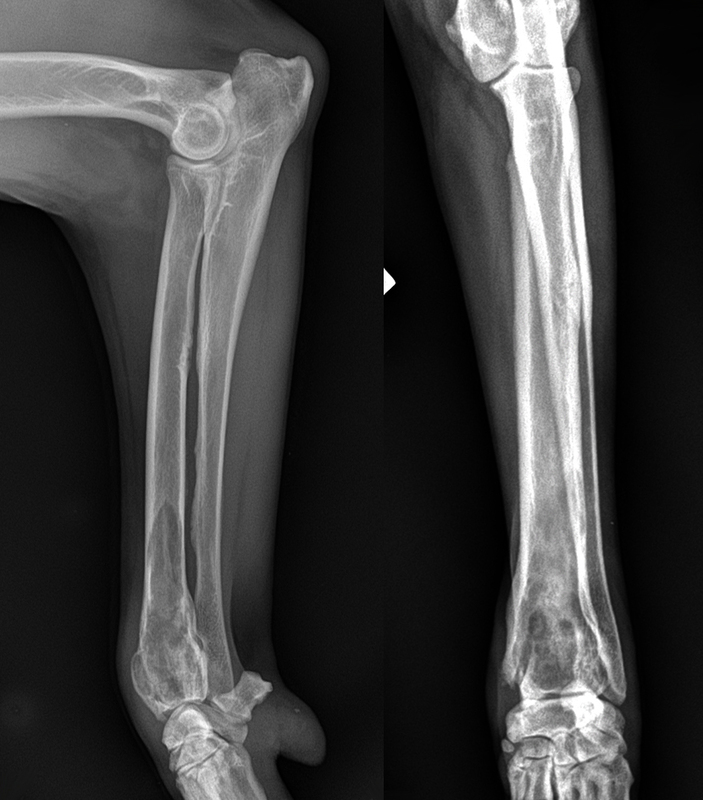 Recently, numerous publications suggest that the Limb-sparing surgery is a viable alternative to limb amputation in selected cases, especially indicated if there is pre-existing orthopedic or neurological disease or if owners are resistant to limb amputation 3,4,5,6.
have been described in the distal aspect of the radius, proximal humerus, distal tibia, and proximal femur in dogs with OSA, but the salvage surgery of the distal aspect of the radius has produced the most favorable results. This is mainly because pancarpal arthrodesis is well tolerated by dogs, not like fusion of other joints. 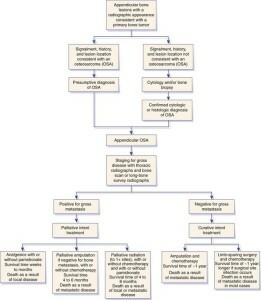 Importantly – the prognosis for survival is the same with amputation or limb- sparing, unless an infection is present, in which case the average survival is prolonged. 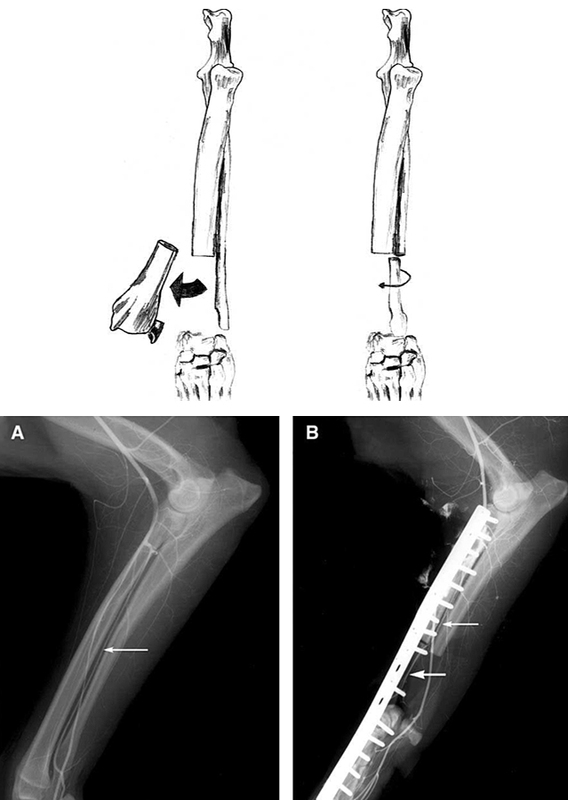 Good surgical candidates are dogs with OSA confined to the bone, with minimal extension into adjacent soft tis­sue and involving less than 50% of the bone length. 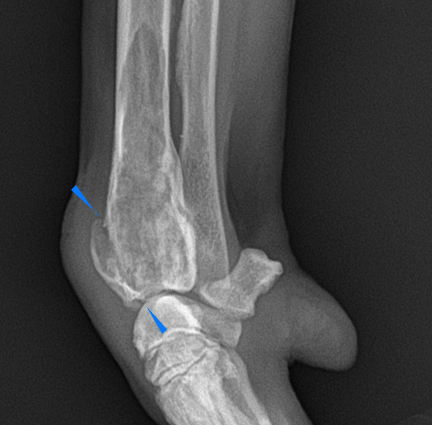 The extent of bone involvement is most accurately determined by using computed tomog­raphy and is overestimated by radiography, nuclear scintigraphy, and magnetic resonance imaging 8. 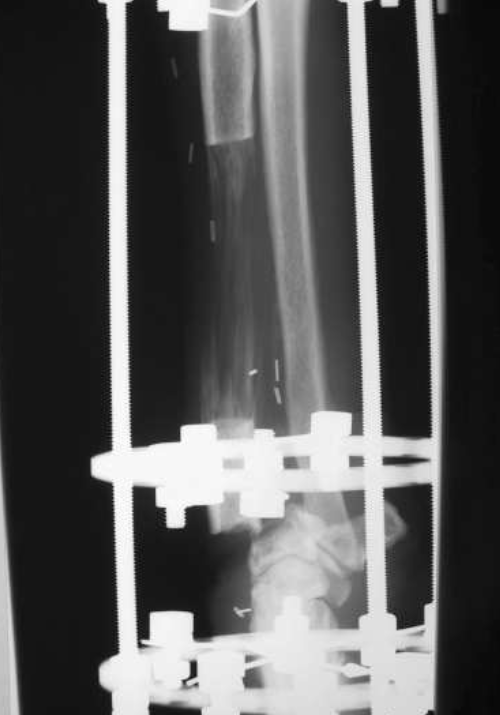 Pathologic fracture is a relative contraindication for limb-sparing because of tumor seeding into adjacent soft tissue, although the risk of local tumor recurrence can be re­duced by use of preoperative chemo­therapy or radiation therapy. Historically, the most commonly performed limb sparing technique for the distal radial site involved the use of an allograft (donor from an individual of the same species) to replace the bone defect created by segmental bone excision 9- Fig.2. Although the limb function is good to excellent in about 80% of dogs with the allograft technique, the complication rate is substantial. The most common complications include infection, implant related problems, and local recurrence. Infection rate is reported to be up to 60%, implant failure in up to 50% as well. 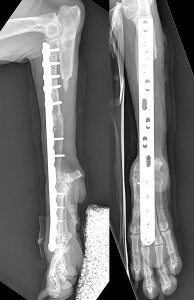 Even more, there are practicality issues for the regular application of the allograft technique- time consuming and costly maintenance of a bone bank. Recently, there is a new alternative for graft purchasing from a commercial source on a case by case basis. It’s not surprising that alternative limb-sparing methods are being investigated. Reported grafting techniques include pasteurized/ irradiated autografts, endoprosthesis, vascularized ulnar transposition graft (roll-over technqique), free microvascular ulnar autograft. 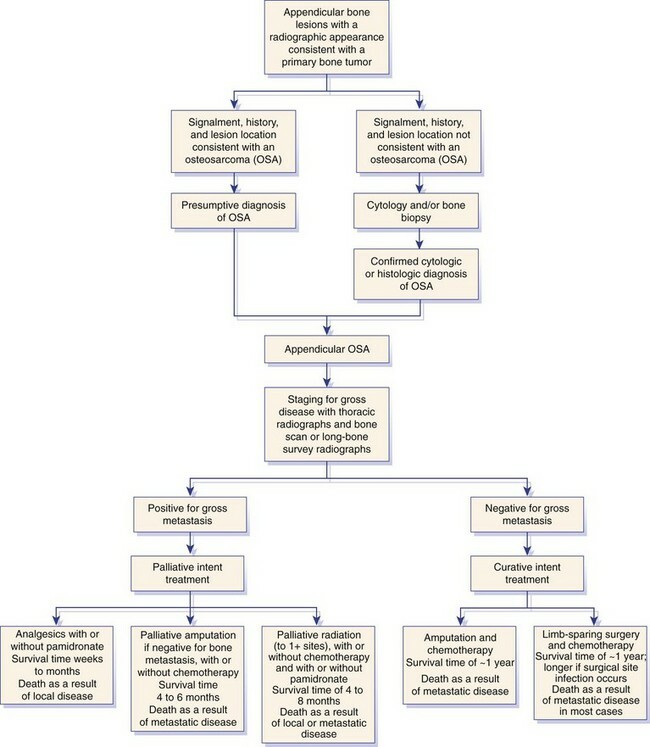 Nevertheless the technical evolution of the available techniques, all of them are still often associated with a high complication rate including infection, construct failure, and tumor recurrence. The longitudinal or transverse bone transport osteogenesis has the advantages to lower the aforementioned complications but still have limitation for routine implementation in the practice 10, 11. The advantages and disadvantages of the recent innovative techniques are shortly summarized below. The most prominent advantage of the endoprosthesis limb salvage (Fig.3) is the simplicity compared to the other grafting techniques; consequently it is time-saving. Decreasing the surgery time may suggest lower infection ration. Unfortunately this was not proved by the clinical experience with the currently commercially available endoprosthesis. A recent study 4, comparing the results of Cortical Allograft and Endoprosthesis techniques, suggested surgical infection of 60 and 55% of the cases, respectively. The use of a large volume of implants and foreign material has been proposed as a cause. 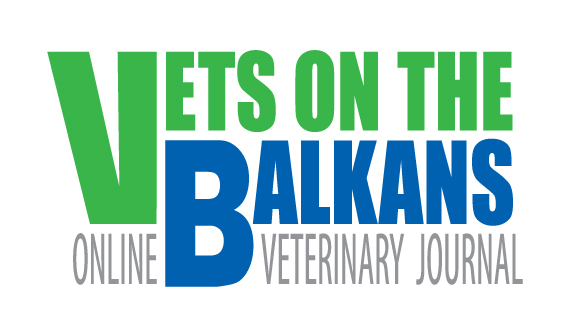 More over in the same study, long term implant failure occurred in 40% of the treated dogs. A positive remark in the paper is the good (subjectively) limb function, reported in the stable phases or in non-complicated cases. A more biologic friendly technique- ulnar roll-over – Fig.4 was resently reported with good results, despite limb shortening of up to 24 % 3,12,13. The distal ulna is osteotomized, rolled into the radial defect, and secured with a bone plate and screws. With this technique the preservation of the caudal interosseous artery and vein and a cuff of the deep digital flexor, abductor pollicis longus, and pronator quadratus muscles are important for maintaining viability of the transplanted ulna. Theoretically, using a vascularized bone graft could reduce the gross incidence of complications compared to an allografts or endoprothesis. Vascularized bone is more resistant to infections, to the extent that vascularized cortical autografts have been used to treat osteomyelitis. Also the use of a viable graft may preserve biomechanical properties over allografts. Whereas the allograft may resorb and become weaker over time, the ulnar graft may maintain its physical properties or even hypertrophy and healing with the host bones. However, the statistics reports are controversial, with no clear proof for substantially better outcomes. One study shows no statistically different infection (45%) and implant failure (55%) ratio. Probably the presence of a viable graft does not address all other factors predisposing to infection (poor soft tissue coverage, immunosuppression from neoplasia and chemotherapy, and use of orthopedic implants). The other complication problem- implant failure, sounds as a surgeon’s skills dependent issue. For example one of the major complication in the mentioned study has been fracture of the remaining radius in cases of great length resection (>57%), which could be just consequence of suboptimal plate length or screws number and distribution. 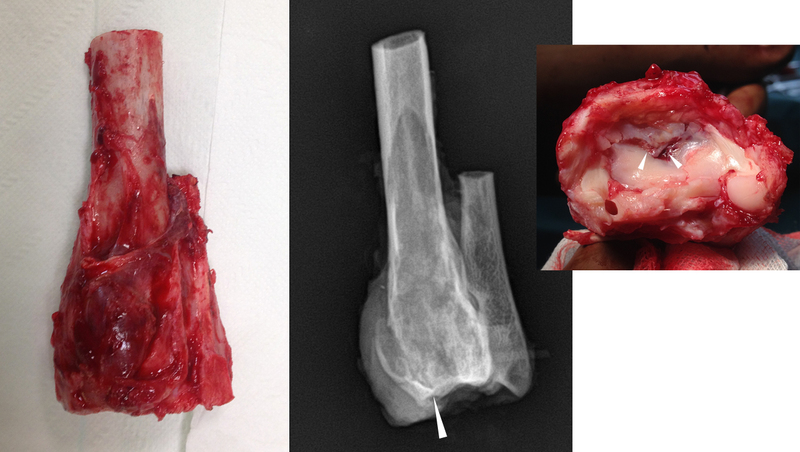 Importantly, the roll-over technique demands sufficient length of the distal ulna to be preserved, but local recurrence was not increased compared to other limb- sparing techniques. 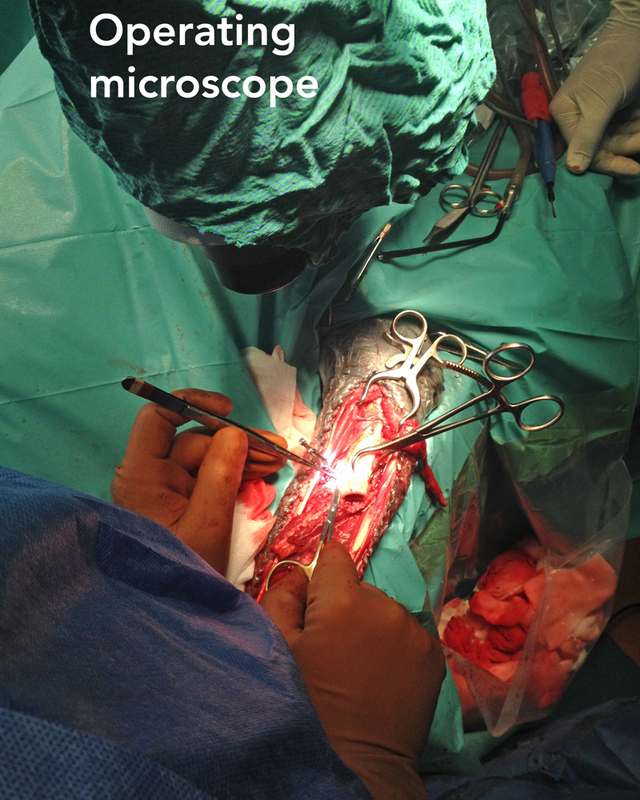 Microvascular anastomosed bone transfer was used in the presented case. 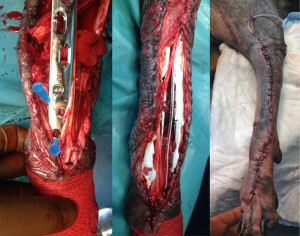 This is a routine procedure in the limb sparing surgeries in human patient, but rarely applied technique in veterinary medicine, nevertheless, the vascular supply of the distal ulna has been , studied, described and successfully used experimentally and clinically 14,15. 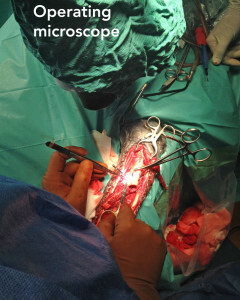 In this technique, a more substantial middiaphysis segment of the ipsilateral ulna, with its source artery and vein (the common interosseous) is harvested and transpositioned, with a blood supply restored by vascular anastomosis to a neighboring artery and vein, once the graft is in its new position. The surgical technique is described further in the text. The concept is the same as the ulnar roll-over but, with the advantages of stronger cortical ulnar graft used, more mobile graft and a chance for full distal ulnar resection. The disadvantages of this procedure are the need for a specially trained and equipped microvascular team and the prolonged surgical time. This is a specific application of distraction osteogenesis, which has been used successfully in dogs for replacement of large segmental defects of the distal aspect of the radius and tibia after tumor resection. This is a process whereby healthy, detached bone segment is sequentially moved across an adjacent segmental osseous defect forming new regenerate bone in the distraction gap -Fig.5.The regenerate bone is highly vascular and resistant to infection. The results following the procedure have been very encouraging, with good orthopedic function and no reported infections. Disadvantages of the bone transport osteogenesis procedure is the significant amount of time required to fill the defect after tumor removal (up to 7 months). 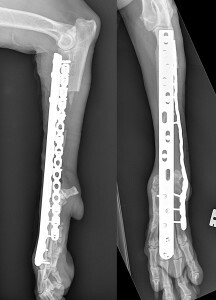 This often leads to owner compliance issues (distracting the apparatus two to four times per day), also pin-tract drainage and loosening, difficulty in docking the intercalary bone onto the radial carpal bone. A recent modification –Transverse Ulnar Bone Transport Osteogenesis, has been reported 16- Fig.6. The technique substantially decrease distraction times. In one case report, distraction of the ulnar transport segment across the 84 mm longitudinal segmental radial defect, was completed in 23 days. A 9-year-old female Rottweiler dog (43 kg) was referred to our practice with a 3- weeks history of left forelimb lameness with an gradual onset and an unknown origin. The dog was been previously prescribed NSAIDs with temporary effect. During our examination we found weight-bearing lameness II/V. Physical and orthopedic examination revealed distal radial swelling on the left forelimb, with pain on extension of the carpal joint. 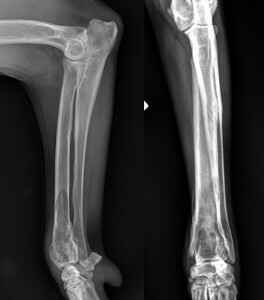 Based on the history, signalment, lesion location, and radiographic findings, a primary bone tumor was suspected. No abnormalities were detected on preoperative 3-view thoracic radiographs, abdominal ultrasound, echocardiography, and blood tests- Fig.8. The Alkaline Phosphatase (AP) value was 195 U/L- in the upper limit but still within the reference range for the breed. 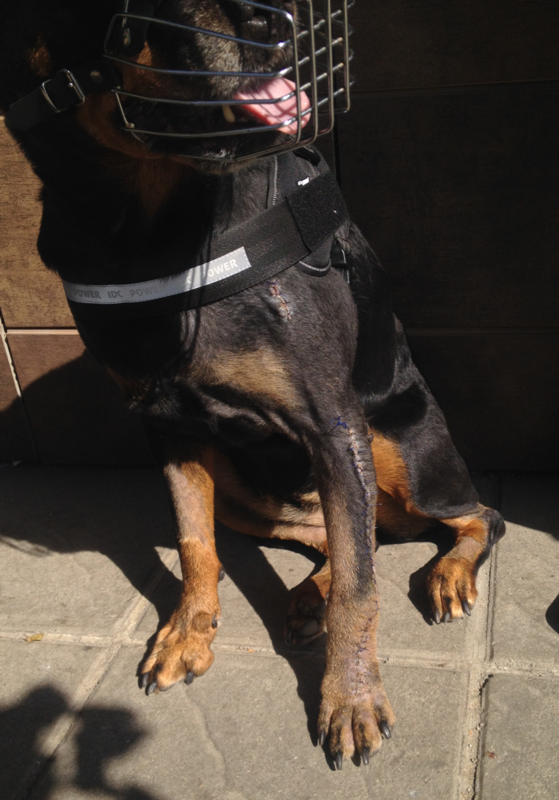 The owners chose the last course of treatment but insisted on preoperative histologic confirmation of the suspected diagnosis. After short anesthesia and minimal invasive approach, tissue biopsy sample was retrieved and send for analysis. 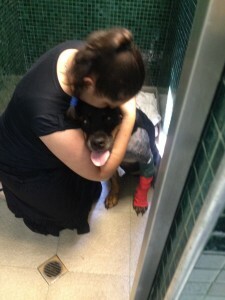 Ten day later the the suspicious of osteosarcoma neoplasia was confirmed. The histologist comments were: moderately aggressive OSA with low mitotic figures. Meanwhile the dog showed acute lameness deterioration, related to a pathological fracture of the cranio-distal cortex of the radius, following the biopsy procedure- Fig.9. A limb sparing procedure (roll-over vs. free vascularized) grafting was planned. Twenty minutes before the skin incision high segmental epidural analgesia wad accomplished at the level of T11, infusing 2 ml of 0,25 % Levobupivacian solution and positioning the patient in left lateral recumbency for 10 minutes- Fig. 10. For the surgical intervention, the dog was positioned in sternal recumbency- Fig 11. , facilitating a dorsal approach to the radius and carpus. Careful tissue examination was done during the sharp dissection of the distal soft tissues. Caudally, the tumor was closely attached to the distal ulna. Thus, the tumor was not dissected caudally to avoid contamination. A decision for a more extending distal ulnar resection was made. This prevented the option for roll-over technique more advanced free vascularized transfer was prepared. After tumor removal the limb sparing was continued with cartilage debridement from the carpal and metacarpal bones , accomplished by using a speed burr drill; several penetrating drill holes were created in dorsal surface of the radial carpal bone. The resected radial bone segment was measured and a second ulnar osteotomy performed proximally using a separate blade to match the length of removed radial bone minus 1,5 cm. 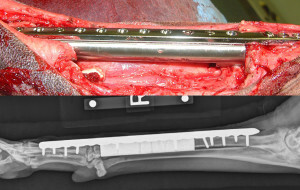 The proximal ulnar osteotomy was performed above the level of the radial osteotomy while identifying and carefully dissecting the caudal interosseous artery and vein.The last were a-traumatically clamped and transected as proximal as possible, preserving as much as possible of the vessel length.The muscle attachments of the abductor pollicis longus, ulnar head of the deep digital flexor, and pronator quadratus were kept intact onto the periosteum of the distal aspect of the ulna. 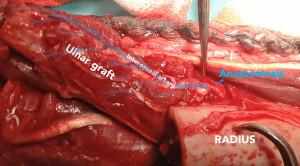 The ulnar graft was transposed into the radial defect and the proximal end of the common interosseal artery (<2 mm) was anastomosed to a distal branch of the median artery. The anastomosis was accomplished with the use of magnification (10x) with surgical microscope and fine jewelers forceps- Fig.14 and 15. General principles of end-to-end vascular anastomosis were followed- atraumatic handling, distance of 0,5- 1 mm from the vascular wound’s edge, the regular suture distance, etc. Five interrupted sutures (8-0 nylon) were used to seal the anastomosis. The total ischemic time of the bone graft was about 60 minutes. The microanastomosis success was confirmed by identification of a active blood flow present in the graft’s tissues and the distal end of the interosseal artery (video 1 ). The corresponding vein was not anastomosed, but its end was left free in the surrounding soft tissues. The distal artery ending was ligated. After the anastomosis, the procedure was finished by stabilization of the bone graft by long plate, engaging from the distal metacarpal bones to the proximal radius, on the cranio-dorsal surface. We used hybrid 4,5 mm plate (Mikromed, human series) allowing fixation with 4,5 mm screw proximally, 3,5 mm in the middle area (free graft) and divergent 2,7 mm screws in the III and IV metacarpal bones. A second orthogonal plate 3,5 mm reconstructive locking (Mikromed) was applied laterally, fixating the proximal radius to the fifth metacarpal bone- Fig.16 and 17. Copious cancellous bone graft (from proximal humerus) was retrieved and stacked at the level of all osteotomy gaps. After copious wound lavage and before closing of the surgical wound, the implants were covered by Gentamycin impreganted bovine collagen sponges (Gentacoll- resorb). The goal of the last was infection prevention. 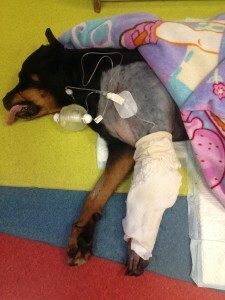 A soaker catheter was also inserted along the full length of the surgical wound. Subcutaneous tissue and skin were closed routinely. After skin suturing, the leg was bandaged with modified Robert -Jones bandage for the next 12 hours. The soaker catheter was attached to elastomeric pump, delivering 1 % Lidocain solution – 5 ml/h, for the next 3 days. Postoperative analgesia consisted of: local Lidocain flash block delivery by the elastomeric pump (36 h) , Butorphanol (0.3 mg/kg, every 6 h, i.v.) and meloxicam (0.1 mg/kg /24h ,s.c.). Cephazolin (20 mg/kg/8 h, i.v.) was applied for 3 days post op. 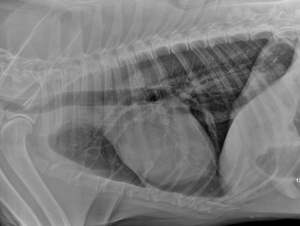 On the third post operative day -the dog was discharged, with oral Cimalgex (Cimicoxib, 2 mg/kg/day) for 14 days. Oral amoxicilin clavulonic acid (12,5 mg/kg/12h) was administered for 2 weeks and exercise was restricted to short walks on a leash for 12 weeks. The dog was re-examined regularly- every 14 days, including the visits for the chemotherapy sessions. 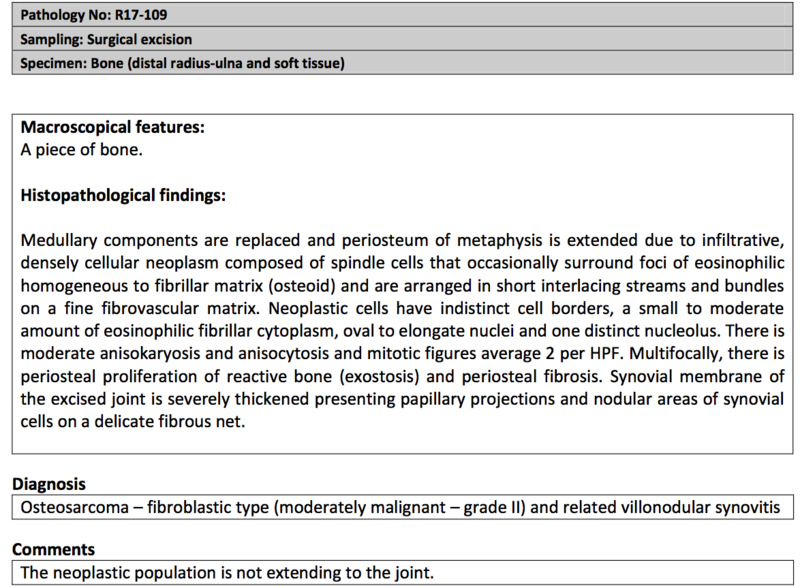 The histopathological diagnosis of the excised bone confirmed a grade II fibroblastic osteosarcoma (OSA)– Fig. 19. 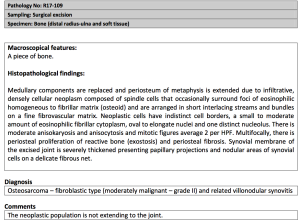 Surgical resection was considered complete with no evidence of neoplasia at joint compartment. 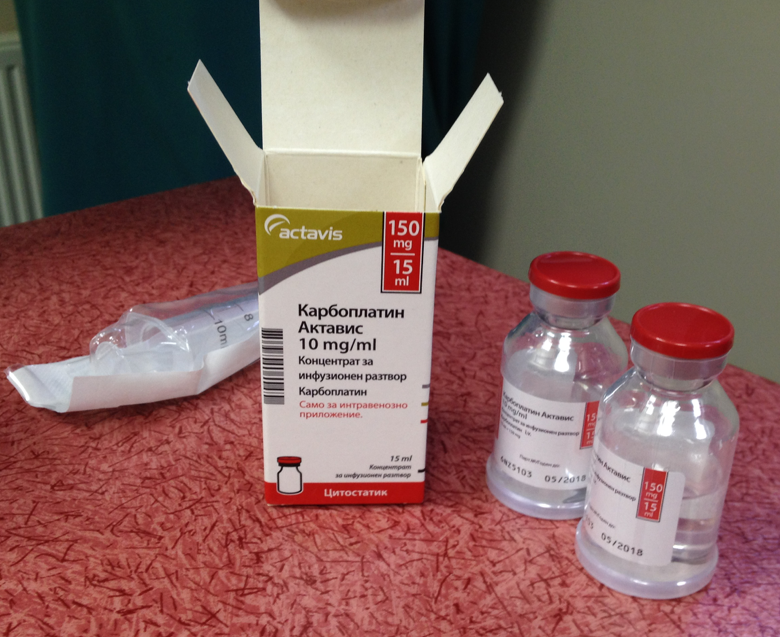 A single agent protocol -carboplatin (300 mg/m2)- Fig. 20, was planned and applied every 3 wk for a total of 5 treatments. The first treatment was started 2 weeks after surgery. A CBC was taken 2 weeks after and just before each carboplatin administration; serum biochemistry was performed every 2 months. There was no evidence of gastrointestinal upset, renal failure or myelosupression after chemotherapy. The AP levels were always in the reference range. Lameness progressively improved from toe-touching (one day after surgery) to full weight-bearing with only slightl visible lameness- 6 weeks post op. No external coaptation was applied during the recovery period- Fig.21, Video 2- 3. Six months post op the limb function was appreciated as excellent, without any significant changes on limb palpation- Fig.22. Video 4. 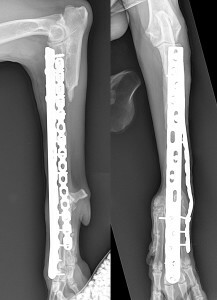 Orthogonal radiographs were taken, showing proximal bone fusion; distally the bone was superimposed by the lateral plate. No signs of construct failure were observed. A decision for dynamisation was made and the lateral plate was removed, revealing radiographically the bony structure under it. It showed good bone density and excellent graft fusion (primary), proximally and distally. Further segment hypertrophy is expected by the increased load sharing. The limb sparing surgery could be a viable option for treating distal radial OSA in properly selected cases. With the innovative alternatives, the widely accepted approach to canine OSA – limb amputation treatment, should not be applied as “default treatment” in each case. Case to case individual approach may provide the pets and their owners more fare attitude. 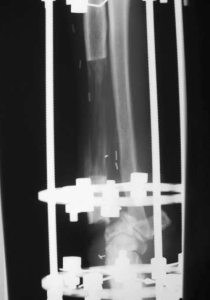 Excellent functional results of the limb may be achieved by a complex (but single stage) surgical segment resection and appropriate bone reconstruction and rigid fixation. The use of free vascularized bone graft is a manageable option and an alternative to ulnar-roll over in cases of distal ulnar tumor engagement or vast radial segments resection, where solid vascular bone grafting is demanded.